Thanks to @metricjulie for a more coherent French translation...and oh yeah, she's a Habs fan. Wait a minute...this is friggin America. For a game that was filled with such media hype it surely didn't disappoint anyone. Coming off a 3-1 loss at home the Pens headed to the great city of Montreal looking to take the lead back in the series. Lead by the charge of Geno and the netminding brilliance of Fleury, the Pens were able to regroup after a disappointing first period to not only win, but keep the Habs scoreless throughout. The game could have went either way. Momentum was on both sides of the ice. It was fast, it was furious, but ultimately the Pens prevailed with patience to nab the 2-1 series lead. The first period was all but glorious for us Pens fans. A loud Montreal fan base set the tone for the game as their beloved Habs came out with a purpose. Holding the Penguins to just three shots on goal they put up seven quality shots of their own and countless scoring chances. The majority of the period was played inside the Penguins zone and it just looked like the Penguins left their desire in Pittsburgh. The buzz on twitter rightly eluded to the stellar play from Fleury. Had not he stayed strong in net the game could have gotten out of hand quickly. Adam from tPB rightly noted that coming out of the first period was a victory of its own. He was right. 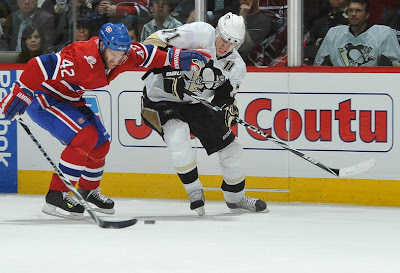 The Pens needed to hold off the force the Habs put on them and look to the periods end to regoup. And regroup they did. A more composed Penguin team took the ice for the second period. Credit the Canadiens for getting the Pens flustered and off their game, particularly the play by Hal Gill and Josh Georges, not to mention the extremely active sticks by the team in red. However it wasn't something they could sustain for the entire 60 minutes. Matter of fact, it pretty much stopped right at the end of the first. Halak didn't have much to do in the first period, but then the Penguins got back to their north and south style of play and put the pressure on. They ended up with 13 shots of their own and incidentally held Montreal to only 3 shots. The ice was tilted after the first 5 minutes of play. The puck was in the Habs zone most of the period and, like the first period, if not for the heroics of Halak the game might have gotten out of hand. Despite the onslaught from Pittsburgh the period ended up still scoreless in what Bill Clement might refer to as a defensive battle. Since I'm now 20 minutes into this and the cold medicine is kicking in, I'll try and be more succinct. With the momentum on their side, the Pens decided it was time to not only break down the defense and establish a strong forecheck, but also get on the board. Just 1:16 Malkin decided to take his anger of yet another Ron Cook article out on Halak. Geno has once again been ostracized by the media. As such it was time to break the 4 game scoring slump (is that even a slump?) and tally the first goal of the night. It was one of those goals we saw in the Ottawa series where Geno takes a slapper from the high slot. Sid did a good job of evading the puck and it slipped past Halak like a midget through customs. After that it was complete team play. Patience in the neutral zone and solid puck management lead to very few scoring chances for Montreal. Though when Montreal did get a chance they made the most of it. Shots from the slot and redirected puck gave Fleury a hard time. Had not he been at his absolute best there's simply no way Pittsburgh would have won this game. 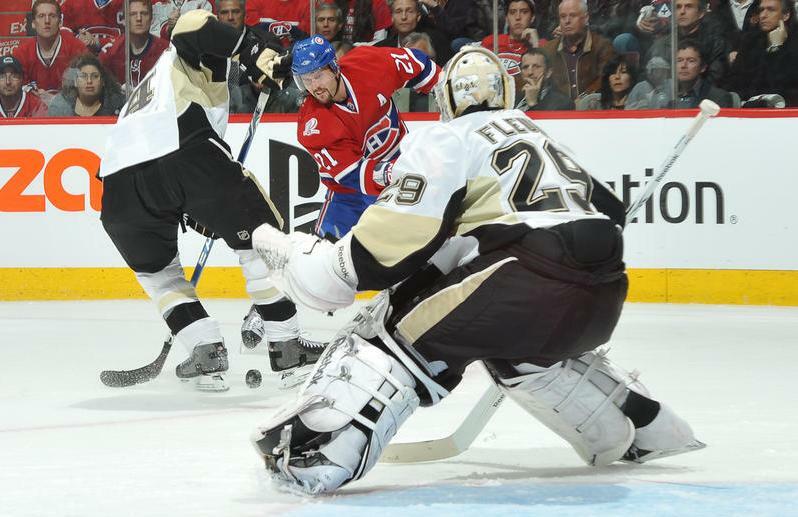 From leg save, to blocker stop, to a chip off the glove, Fleury was in the zone. Like to thank Todd for drinking Heineken and for his ex-wife to not call. You have to love the all around play of Cooke, Kennedy and even Letestu. 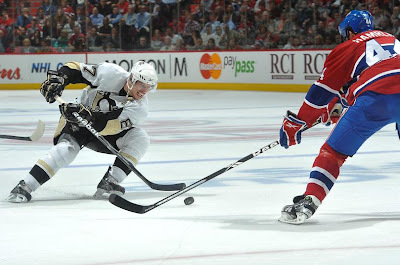 Physical game: Pens out hit the Habs 29-25. Leopold 6 blocked shots, Orpik 7. That's huge. Geno, a beast. Came up huge in periods 2 and 3. Game 4 on Thursday. Pens win this and its on to the ECF. Been there, done that.